Save $100 off Feb. 19-24. Book now! Discounted Secret Pass Lift Tickets available, ask me how! Book any 7 night, Saturday to Saturday stay and save $50. Now booking for Summer, call or submit an inquiry for specials! Discounts on 7 night stays. Call for more information! 'Like' us on Facebook and receive $50 off any stay of 4 nights or more! 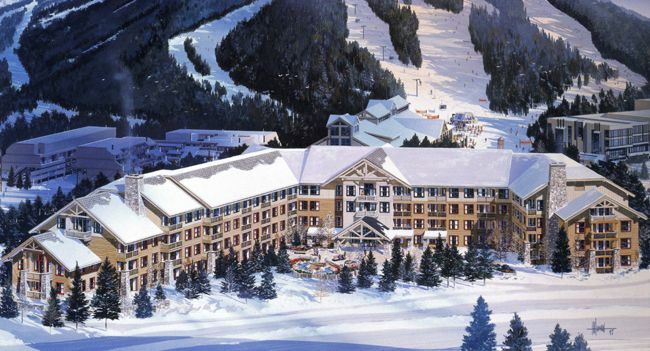 **BEST DEAL ON THE MOUNTAIN for a GREAT CONDO ** Book a full week and 1 night is FREE! Across the street from Molly B's and located at the base of Copper Mountain's new six-person Super 'B' lift - take the Super 'B' 2400 vertical feet to the top of the mountain in seven minutes, and access 20 lifts, four bowls, and 2500 acres of great skiing. Great summer location, too, at the first hole of the acclaimed 18-hole Copper Creek Golf Course. If you are looking for more exercise then just skiing, you will find a full workout facility in the Lodge, as well as access to the Copper Athletic Club. Or, enjoy a relaxing day or evening in front of the gas fireplace. Perhaps a soak in one of two central outdoor rock hot tubs, then dinner at the new Molly 'B' Saloon, or walk to many other fine eateries close by. Rack 'em up on the billiards table. Parking and getting around is also stress free. Copper Springs has secure, heated, underground, garage parking and the shuttle stop is right out front. Use the FREE shuttle service to travel anywhere in Copper Mountain Resort or just around the corner to other parts of Summit County: Keystone, Breckenridge, Arapahoe Basin, and Outlet Malls. Fifteen miles to Breckenridge, 25 miles to Vail, and eight miles to Factory Outlet Shopping at Silverthorne. Take the elevator to this one bedroom, third floor, non-smoking unit with spectacular mountain views. The unit sleeps four comfortably with a queen-size bed in the private bedroom and a queen-size sleeper sofa with upgraded mattress. The kitchen is fully furnished. The unit's private deck overlooks the first green of the 18-hole Copper Creek Golf Course and Ten Mile Range. Our Golf Discount is 20% off. Book now! Copper is a great place to spend your Summer Vacation! With the nearby golf course, Woodward training facility and great fishing, you'll have lots to do and our condo gets you close to all the great activities. My name is Sarah and I live in Golden, Colorado. My family owns multiple vacation properties in Summit County and we enjoy spending as much time as possible in the mountains. We chose this property as an investment that we enjoy offering to our guests. It's proximity to the lifts and restaurants makes it an ideal vacation rental. The building offers several amenities to our guests as well. Located just down the hall a few feet! Brand new Flat screen tv with netflix and other apps! Copper has a great golf course to enjoy in the Summer! We even offer golf discounts! Comfortable and so close to Super Bee! Excellent for short stay. We stayed for more than 2 weeks; wish there were more hangers! Would book again. Great location! Easy check-in/check-out! Needs new bed pillows😁�! The condo was ok for 2 people. Storage space was limited. sofa, carpet,Pots pans etc show wear and age. Limited kitchen cook and bake ware. Unit was clean. Unit needs some TLC. Kitchen chandelier fabric/paper needs replacing, paper towel holder needs re gluing, toilet paper holder is loose. Carpet has some stains. It was so nice walking to the best lift. Taking a break at condo and back out after lunch. When we comw back to Copper we definitely want to stay here! Great Location - Love Copper Mountain! The location of the condo is great! Very easy to get in and around. As we were there for a wedding and there were many others in our group staying in East Village, as well, in the exclusive West Village area, our condo was at the lower end of the scale. The decor was quite dated, one of the patio blinds was broken, as well as the ironing board. Nonetheless, it was clean, had a nice fireplace and was conveniently located for our purposes. Go-Kart racing is available in Copper in the Summer. Also, the Woodward Skatepark is within walking distance. This quoted rate is subject to change until confirmed with the owner. Our contract will be sent separately if you are using the book it now button.